Canon cameras use a range of batteries for main camera functions and back-up. This info page contains camera battery types and associated information. Whilst it may be tempting to buy cheap ‘knock-off’ batteries – just be aware that some can be dangerous or just not work very well. I’ve written up some info on our blog about some of the issues. Mar 2016 – updated travel info. Canon uses four types for EOS Digital SLR cameras. Older camera batteries use nickel-metal hydride (NiMH) technology, whereas new cameras use Li-ion (lithium-ion). Li-ion cells tend to weigh about a third less than NiMH and are completely free from the memory effect. This is one way batteries gradually lose capacity after successive recharge cycles (but see Memory Effect below). In April 2016 air travel regulations change some aspects pertaining to taking batteries with you. There is an IATA PDF that covers the changes. It’s perhaps a bit complex for most people though. Work out the Watt Hour capacity of your battery. This is simply amp-hours times voltage. Remember that you need to divide mAH by 1000 to get amp-hours, so the new LP-E19 (7.4V 2700 mAh) is 7.4 x 2.7 = ~20 Watt Hours. If installed in equipment: may be in your carry-on or may be in your checked bag. If carried as individual batteries (outside equipment): may be in your carry on, but not in your checked bag. There is no limit to the number of such separate batteries you can carry. You do not need the approval of the airline for this. If carried as individual batteries (outside equipment): you may carry a maximum of two such batteries in your carry on, you cannot have any in your checked bag. You may need the airline’s approval to carry batteries of this size. Cannot be on passenger planes. Must be presented as cargo and shipped according to IATA Dangerous Goods regulations. 2012 Note that the LP-E6 and LP-E6N can be used interchangeably, but the LP-E6 cannot* be charged in the E6N charger. The differences are due to changed design regulations in Japan. *This info came from Canon at the time of the change, and I’ve not seen it repeated. The N version has slightly higher capacity. Having used E6 and E6N batteries in my 5Ds with it’s supplied E6E charger, I’d suggest that it’s not something to be overly concerned about. 2011 Note that many lower end cameras do not have an interchangeable backup or ‘date/time’ battery – the internal power source is charged from the main battery and should retain data for about 3 months if in good condition. The battery typically takes at least 8 hrs to initially charge. If this cell fails, the camera needs servicing to replace it. LP-E4N type must be charged with the LC-E4N to achieve full performance. Which camera uses which battery? EOS 1D X mk2 √ ? Which charger charges which battery? Sometimes a problem with older NiCad batteries, and much more rarely so with NiMH types, this is not a problem with Li-ion types. The new LP-E4 and LP-E6 packs can also be refreshed, which although not to fix any memory effect, does help maximise battery performance. If your charger doesn’t have a refresh option then you can safely fully discharge a battery pack by turning off the auto shutdown feature of your camera and leaving it switched on until it shuts down. Many EOS film cameras use 2CR5 batteries. The EOS 500, 500N, 5000 and IX use two CR123A batteries; the EOS-1N RS and 1V HS use eight AA batteries, though the 1V HS can also use the NP-E2 NiMh pack (as with the EOS 1D series cameras). The 2CR5 and CR123A are both lithium batteries designed for use in high power electronic equipment. There are a lot of cheap camera batteries available from places such as eBay. Be very careful if you buy cheap replacement batteries off the net. At best, many have much less capacity than advertised, and at worst they may represent a fire hazard. To see the sort of variation you can get in camera battery performance see the second link below. Canon in the US have published a guide to checking for fakes. In rare cases, the orange lamp on the Canon Charger LC-E6 will blink rapidly at regular intervals when the Canon Pack LP-E6 is inserted. 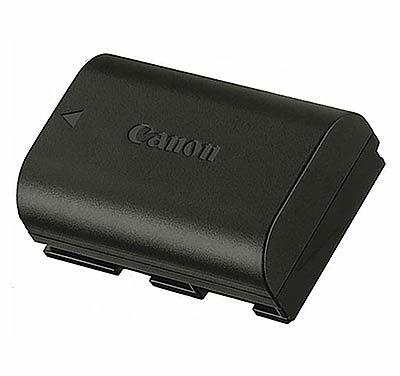 In such cases, charging the Canon Pack LP-E6 in the Canon Charger LC-E6 is not possible. This symptom may occur when a Canon Battery Pack LP-E6 has been discharged due to being unused for a prolonged period of time, such as when it is first purchased. If this occurs, please follow the procedure below.